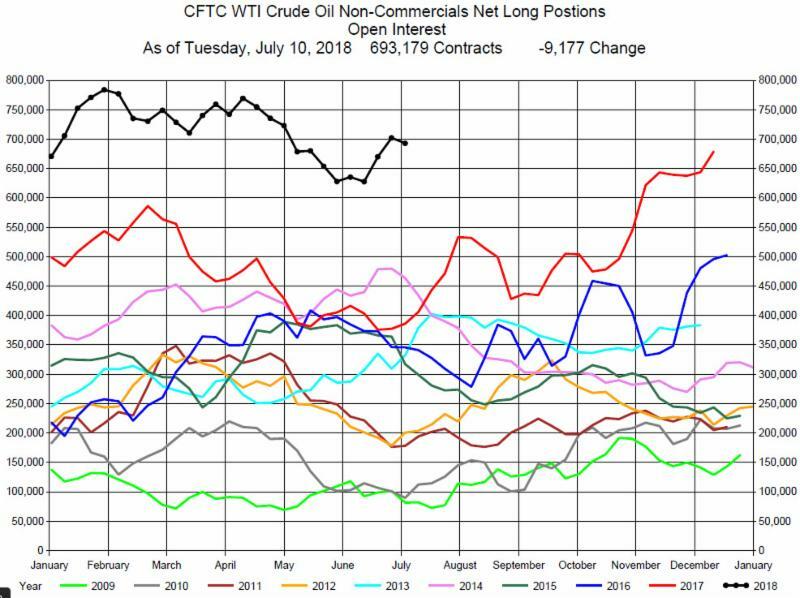 The latest CFTC Commitment of Traders Report as of Tuesday, July 10, 2018 shows the Non-Commercials Net Long Positions decreased during the week by 9,177 contracts to 693,179 contracts. 9,056 Long positions were closed and 121 Short positions were established. The Funds remain bullish despite the slight adjustment in Net Long Positions as crude oil supply disruptions in Libya and Nigeria as well as the sanctions against Iran keep prices relatively high. Prices had a significant one day drop on Wednesday, July 11, 2018 so it will be interesting to see if the drop in prices is reflected in next week’s report.